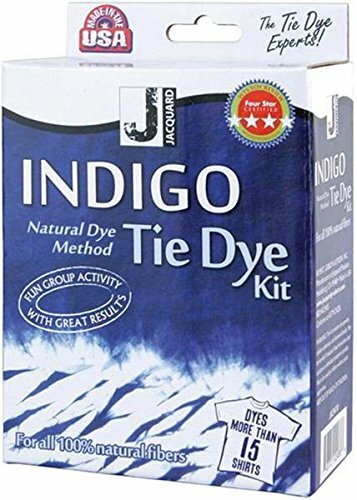 Jacquard Indigo Tie-Dye Kit includes pre-reduced indigo, reducing agent, gloves, rubber bands, 2 wood blocks, quick start instructions and cultural overview of indigo. Kit dyes up to 15 yd or 5 lb of fabric or 15 t-shirts and includes everything you require for dyeing. It is an user-friendly formulation of ancient indigo dyeing art brought to the home dyer and the dye bath lasts for several weeks. Kit allows natural dye process that is used in many cultures around the world. Indigo dye used for coloring fabrics and blue jeans is one of the oldest dyes that comes from a plant. Indigo dyeing features unique characteristics that facilitates convenient creation of beautiful resist patterns on fabric.